ANGELA KERINS HAS said that the Rehab Group is not a state-run organisation, its staff are not public servants and they do not have access to public sector pension funds. The Rehab chief executive also told the Oireachtas Public Accounts Committee (PAC) that her salary is set by the board of Rehab with advice from “independent remuneration experts” and defended her €240,000 annual pay, saying she is a private citizen and is not paid by the taxpayer. The committee spent nearly seven hours grilling Kerins and three other Rehab executives, who declined to disclose their salaries, along with officials from two government departments, the HSE and Solas today. 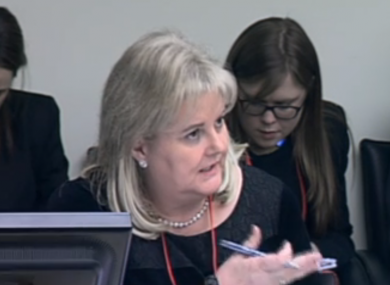 Under robust questioning, Kerins mounted a strong defence of the disability charity saying repeatedly that it is not a public sector organisation. Various committee members expressed dissatisfaction with her contribution and with the fact that the former CEO Frank Flannery was not present today to account for how he, as member of the remuneration committee, determined Kerins’s and other executives’ salaries. Kerins said a comprehensive scoring system is used to set remuneration and that the salaries of the group’s management team are currently set “at least 20 per cent below that current market median” for an organisation of Rehab’s size and structure. Kerins said her base salary is about 10 per cent lower than the market median with it coming to 20 per cent when the bonus she has waived is included. She also told the committee that her contract entitles her to a bonus of up to 35 per cent of her salary or around €84,000, but said she has waived this. Kerins said she has “no idea” what her pension will be when she retires. Under robust questioning from Sinn Féin’s Mary Lou McDonald (below), Kerins could not say why her salary increased by €6,000 in recent years having previously been disclosed as €234,000 in 2011. She later declined to tell Shane Ross whether she had receved a pay increase. Kerins could also not provide information on the pension arrangements of Fine Gael advisor and former Rehab CEO Flannery or details on consultancy he provides from “time to time” for the organisation. Kerins acknowledged that Rehab is a “unique” organisation with an “unusual” structure and that the analogy of it being like a semi-state company is “not a bad comparison”. She pointed out that average CEO salary in the semi-state sector in 2010 was €291,000. “We are proud of what we do and how we do it,” the chief executive told TDs in her opening statement this morning, expressing surprise at the public debate surrounding her salary and the activities of Rehab in recent weeks. “We’ve wondered what have we done wrong?” she said. Kerins said Rehab has been praised internationally for being an “entrepreneurial, can-do, innovative organisation” and gives “value for money to our customers”. Earlier, the HSE’s Tony O’Brien has told the committee that his organisation is satisfied that Rehab is discharging its role and responsibilities in relation to HSE funding to an acceptable level. Some €50m a year is paid by the HSE to two Rehab companies, Rehabcare and the National Learning Network (NLN). The secretary general of the Department of Justice, Brian Purcell, told TDs that money Rehab receives under the charitable lotteries scheme must be used for charitable activities and said the charity gets two-thirds of all funding under the scheme proportionate to their gross annual lottery ticket sales. In total the Rehab Group has received €86 million in payments from the scheme out of a total of €124 million paid to 19 private charitable lotteries. It’s expected the scheme will be phased out by 2015. Rehab receives some €82 million in state funding every year and employs 2,300 people in Ireland. It is the largest employer of people with disabilities in the country, Kerins said earlier. It also emerged today that Rehab pays corporation tax in Poland, not in Ireland, and it does not pay DIRT in this State either. Kerins was appearing before the committee in the wake of the disclosure that she earns €240,000 annually, as well as revelation that Rehab made a €9,000 profit from €4 million worth of scratch card sales in 2010. Email “Angela Kerins defends €240k salary and insists she is not paid by taxpayer”. Feedback on “Angela Kerins defends €240k salary and insists she is not paid by taxpayer”.